I began by asking John if he found it tricky writing fiction based on real events, and incorporating characters based on once-living people. I expected the answer yes, followed by discussion of the kinds of negotiation between (supposed) fact and (outright) fiction that historical novelists often allow themselves. But John is after all an historian of psychology, and he was firm: history comes first. He said the only major historical liberty he allowed himself was to have an invented character, Ronnie Simpson, present with Raffles and Farquhar at the founding of Singapore. He also shifted the odd date, but otherwise his portrayal of history aimed for accuracy. Of course, he did have to invent dialogue for some of the characters based on real people, but he said when he did so, he always aimed for plausibility - for remarks these characters could have made based on what he knew about them. Meanwhile, the forbidden hill which gives the novel its title is a real place - it is now known as Fort Canning. Given John's fondness for reality, I asked whether any of his made-up characters incorporated traits drawn from real people. John said he often gave his made-up characters the names of acquaintances - always with permission, or else he'd have lawyers on his back. John has an extremely creepy, almost vampire-like, villain, Harry Purser. He told me this was the name of a long-standing friend, indeed his best man, now unfortunately departed. He named his villain in tribute to his friend - both he and the real Harry Purser's widow agreed he would much rather have been memorialised as a villain, than as a good guy! Six books combine into quite an undertaking. 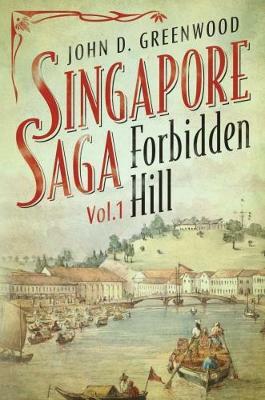 The first three volumes of the Singapore Saga are already written - Forbidden Hill is soon to be followed by Chasing the Dragon, set in the 1840s and 1850s, partly in Sarawak, and Hungry Ghosts, which features the naturalist and co-developer, with Darwin, of the theory of evolution, Alfred Russel Wallace. I asked John about how he undertook research for a project as potentially sprawling as the Singapore Saga. He explained he returned to Singapore for his second stint as a visiting professor at NUS in 2008 / 2009, and that this was when he undertook much of the research. He described the pleasure of retreating into the darkened microfiche room of the university's reference library: "I'd be reading all these newspaper reports, and I'd be transported back there - to the 1820s. Murder! Shipwreck! Disappearances! Chinese merchants disavowing their wives! I took several plot-lines from the newspapers." There is certainly plenty of drama in Forbidden Hill, but it also incorporates myths, legends and folklore drawn from Malay, Indian and Chinese sources. John said one of his favourite passages concerns Forbidden Hill's former occupants, ghosts, leaving at the advent of the British. The departure is witnessed by a Malay character, Badang, drawn at night by the sound of ghostly singing to the keramat (shrine) on Forbidden Hill. All at once the singing stops: "And then he saw them emerge from the trees and thickets. A long procession of men, women, and children walked across the clearing, past the keramat and into the black depths of the cave." But how real is this cave? "Bandang emerged from his place of hiding, and followed them to the entrance of the cave…But as he approached, he found there was no cave, only a mass of solid black rock." John said he liked the story of ghosts leaving Forbidden Hill because it evokes folktales from other parts of the world - including those familiar to him from Britain, where there are tales of the old Celtic gods leaving at the advent of Christianity. As to his favourite character, John said he's partial to Siti, a feisty woman who starts the novel as one of the local sultan's concubines, and ends up helping her recently-acquired Chinese husband to run his business, both in good times, and following financial disaster. If he enjoyed writing about the ghosts quitting Forbidden Hill, and also about Siti, then John was perhaps less enthusiastic about writing romance. Ronnie Simpson meets a "bonnie lassie", Sarah, and soon enough they marry. John said he initially found writing their story a challenge, since romance was not something he was used to writing about, but that it got easier with practice - and we agreed there was no formula to writing romance. John said that his overall ambition with the Singapore Saga, is: "To write a really good narrative story, through reading which people can learn about Singapore: a good story; authentic history; and folklore. That's what I'm after." 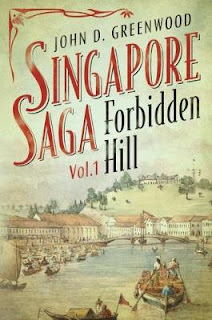 Details: Forbidden Hill, volume1 of the Singapore Saga, is published in paperback and eBook by Monsoon Books, priced in local currencies.